I have a job this week to paint some custom crown molding in a large bedroom with a 12 foot ceiling. Here's a tip for you if ever have to do this. 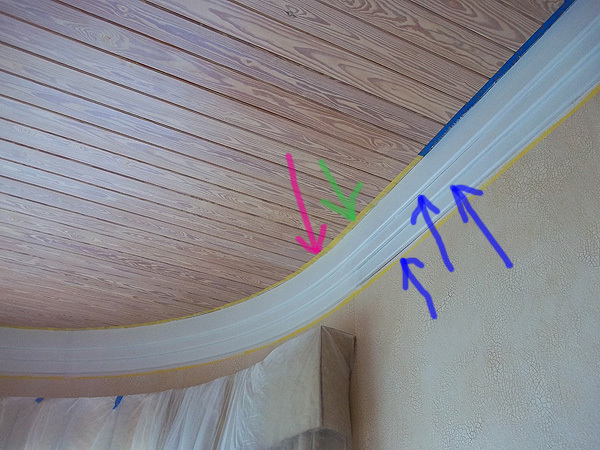 When the carpenters installed the crown what they did was take some 1 by 6 poplar and routed a curved edge to it. Then they installed the bottom piece first, then the second and so on. So of course there are joints and a million nail holes. A couple of the joints where not great by any means. A few were pretty bad. 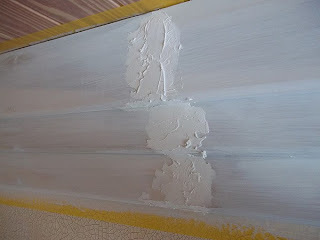 So I had to use quite a bit of filler in areas, especially at the joints. The first thing I do is go and sand around all the nails holes and joints to make them as flush with the surface of the wood as possible. 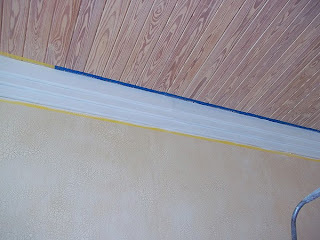 Then I paint with an oil based primer called Cover Stain. Once that dries I use some filler on the holes and joints. Once the filler dries I sand it smooth to be flush with the surface of the wood. 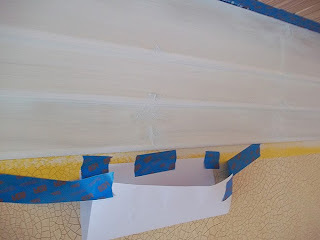 When you do that a lot of sanding dust falls down, so an easy way to get that is to fold a piece of paper and tape it under where you are sanding. The sanding dust falls down into that and makes for a much easier clean up all the way around. That's my tip of the day for you. Here's a spot where they made three joints in the same place. The transition from one side of the joint to the other was not great at all. So first I sanded it as best I could and then used the filler. After sanding the above place you can't tell a joint is even there. By the way I use a low tack tape to tape off the ceiling and wall. The oil based primer I use is what you want with new wood because it blocks any stains from the wood coming through better than any waterbased primer will. This next photo shows a few things. One end of the bedroom has a curved wall with windows that overlooks the intercoastal waters. Well on the straight wall they used wood but on the curved wall they used a pvc board. The joint is between the green and red arrows. It was a pretty bad job there. The top of the joint was actually about a quarter of an inch off, meaning that one side of the joint stuck out a quarter of an inch more that the other. I really had to use quite a bit of filler to get that area to look good. I had to extend the filler out quite a bit on the pvc side (the lower side) so the transition would be smooth. The other side was not great but not as bad as this side. The blue arrows indicate where I have to caulk. You can see the gap indicated by the left most blue arrow between the wall and the crown. No wall is ever straight so as you go around the room that gap is sometimes flush and sometimes almost a quarter of an inch. It has to be caulked. Also as you go around the room the other two blue arrows are at the seam of each of the levels of the crown and that has to be caulked also as again there are gaps here and there but nearly as great as the first board has against the wall. So the last thing I did today after all the filler was sanded flush was to run another coat of the primer over it all. 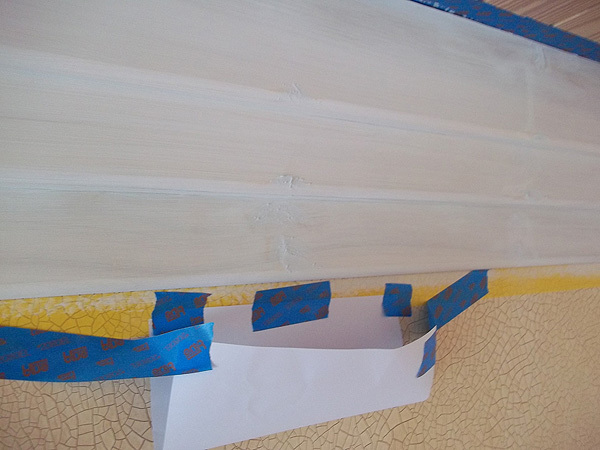 Now its sealed about as good as you could get it and ready to paint right after I caulk it. You want to get all the sanding done before you caulk as you can't sand caulk, its the last step before painting.